Eleven parks across the capital have benefitted from a £6m refurbishment grant from London Mayor Boris Johnson. Burgess Park in Southwark, south London, was allocated £2m while the other 10 parks got £400,000 each. The green spaces were chosen via a public vote where more than 110,000 people named their choice. Under the revamp, the parks will get better footpaths, more lighting, refurbished public toilets and new play areas for children. Calling the response to the 'parks plebiscite' as a "show of people power" Mr Johnson said: "Londoners deserve a better quality of life and making a greener, more attractive city is a top priority." Many parks will get new cafes and improved cycle routes, while traditional flower gardens will be restored and some parks will provide plots for communities to grow fruit and vegetables. The 'Help a London Park' programme was launched in November 2008 and 47 parks across London were shortlisted to face the public vote. 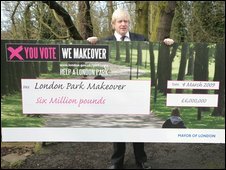 The mayor's office said funding for the parks improvement scheme came from the money saved from cutting The Londoner newspaper. • Wandle Park in Croydon, south London.